Tarzan’s media adaptations have been as spotty as a leopard skin loincloth. He’s been in bad movies and good movies, bad TV and good TV, bad comics and good comics. 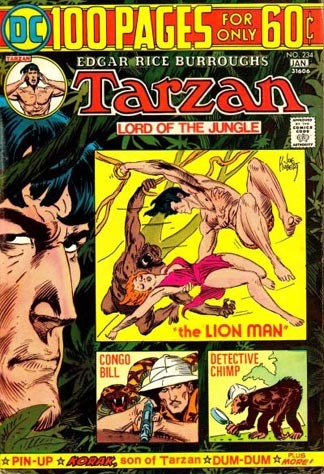 The problem with most of his comic book adaptations mirrors that of his weaker films and TV shows: The lord of the jungle is usually portrayed as a short-haired, clean cut veritable park ranger who just happens to live in a tree and has apes for relatives. The Tarzan comic strip, begun in 1929, remained true to Edgar Rice Burroughs’ stories, lavishly illustrated by the legendary Hal Foster and later Burne Hogarth, Russ Manning (and other lesser stars). But Lord Greystoke’s comic books (beginning in the 1940s) published by Dell, Gold Key and others usually featured a more watered down version of the character (at least visually). 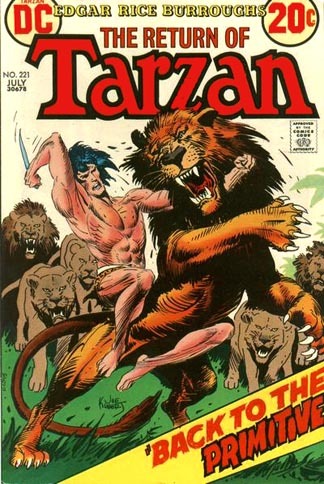 But in 1972, DC Comics acquired the rights to Tarzan comics, picking up with the numbering left off by Gold Key. TARZAN #207 began a retelling of the origin, followed by adaptations of other Burroughs novels and stories, written and drawn by Joe Kubert, by that time already a legend through his work on Hawkman, Viking Prince, Sgt. Rock and other titles. But to my eyes, the artist (then in his early 40s... my age!!!) was about to create his signature work. Kubert’s fluid, naturalistic, yet scratchy pen proved a perfect match for the character and his environs. This ape-man had long hair, scars and a savage, yet regal visage, set against a jungle that looked foreboding but beautiful, populated by beasts that were obviously not drawn from stuffed animal reference and visited by gorgeous, often dangerous women! Kubert (who also edited the series and its spin-offs KORAK, SON OF TARZAN and WEIRD WORLDS) handled the vines of TARZAN through most of the 1970s, until Marvel acquired the rights in 1977. That series was drawn by the likewise legendary John Buscema, and in a style that seemed to ape (no pun intended) Kubert’s style, but it never quite captured the jungle flavor to the perfect extent that DC's did. Dark Horse has reprinted Kubert’s DC TARZAN material in expensive hardbacks, but as usual, the stuff looks much better in its original bronze era newsprint (and they are affordable as well). Here are the covers to #221 (July 1973) and #234 (Dec. 1974) by the amazing Joe Kubert. Bronze Beauties #18: The Invincible IRON MAN!